There is more technology than ever being applied to the fashioning of clothing. For example, these polo shirts with sublimation has been crafted to include a heathered look, the result of which is amazing to look at & to wear. Besides the stunning appearance, there is performance. 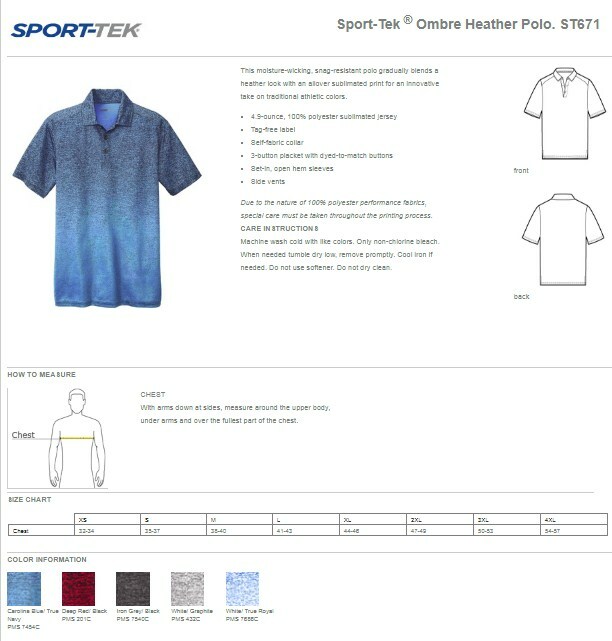 The subliminated jersey poly fabric has been woven to resist snags, and to wick perspiration & odor. These men's golf shirts have vents on the sides for those who wear their sports shirts untucked. The placket has three buttons, which are the same color as the fabric. Choose from five colors and sizes ranging from extra-small to big men's plus 4xl. Bulk Pricing.